Watch a "Baking tips with Abi" video clip showing you how to use the piping gun that comes with the Children's Cake Decorating Kit. Even beginners can make beautiful decorations, from royal icing roses to chocolate stars with this colourful cake decorating kit. 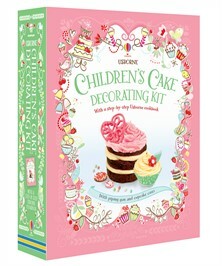 The kit includes an icing gun with four nozzles, decorated cupcake cases and an Usborne book with over 50 recipes and decoration ideas. Every recipe is illustrated, with simple, step-by-step instructions and photographs.